Male pregnancy is possible in the near future. Kirtly Jones from Obstetrics and Gynecology at the University of Utah Healthcare says human embryos can be produced from ordinary skin cells. So women can use this technology too. If you encounter such a case in your practice (or possibly not), EMSOW team has prepared a new feature to improve your image management. To streamline your exam management, we have added a new module called Task manager. You can find it in the Dispatch dropdown menu on the upper navigation bar. The new functionality allows you to add tasks related to your exams. For example, your client may require a film and a CD in addition to DICOM images. 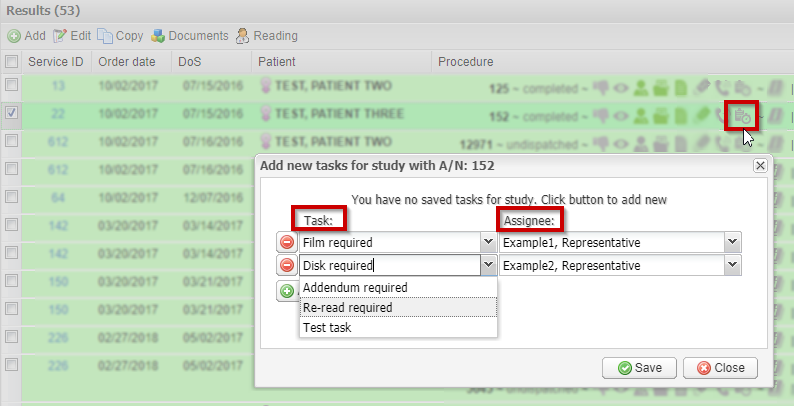 Go to the Dispatch module, select the needed study, click on the Exam Tasks icon, set one or several tasks, and assign them to the responsible employees. Managers can track the task progress, and employees can mark the tasks as complete or incomplete in the Task Manager module. Use search filters to retrieve the tasks easily. To enable this feature in your system, please contact EMSOW support: support@emsow.com. Hello, world! First, some insurance facts. Did you know that alien abduction insurance in the USA exists since 1987, Gene Simmons from the Kiss band has insured his tongue for $1,000,000 (quite reasonable! ), and Starbucks pays for their employees’ insurance more than for their coffee? As for EMSOW’s insurance and billing sections, this week we have completed a new feature to improve your claims management, as well as another useful option. Both upgrades were suggested by our customers! Claims management is gradually becoming more complex, and EMSOW team is keeping up with the ever-changing business environment. 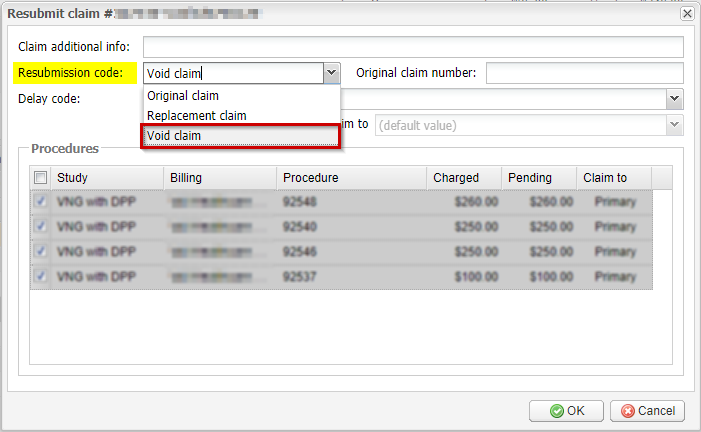 Now, you can resubmit claims not only as original or replacement claims, but also as void claims. To use this option, double-click on the needed service, hover the mouse pointer over the electronic claim that you need to resubmit, click on the Resubmit icon, and select the claim type in the Resubmission code field. The void claims contain 8 in Box 22 of the 1500 form. We have increased the versatility of EMSOW’s workflow for imaging technologists. Previously, the system would always assign a reading provider and send studies for reading automatically, immediately upon the technologist’s completion of a preliminary report. We have added an option to disable the automatic reading assignment, which allows you to have more control over your workflow. If you want to modify your setup, please contact EMSOW support: support@emsow.com. A week ago a Charity group called University of the Underground launched a series of audio releases recorded on X-ray film. The project attracted the iconic artists and lecturers: Massive Attack, Sigur Rós, Noam Chomsky and many more. Great way of X-ray film utilization (although not quite new). However, if you are going to send your x-rays for reading and billing, instead of engraving your new album on them, the latest EMSOW upgrade is just what you need. We have increased the versatility and automation of EMSOW billing features. If you send exams to an external reading facility, you may not always know which doctor will interpret them. This poses a problem for billers if they need to use a specific doctor’s NPI to bill for the externally read exams. Now EMSOW can assign certain doctors to such exams based on the reports received from external systems. EMSOW analyzes the report, automatically retrieves the reading doctor’s name and assigns the doctor to the corresponding study. With this upgrade, your billers will not have to open each received report and check which doctor provided it—they can proceed straight to claim generation! For this functionality to work, the external reading doctors have to be added to the Reading Doctors module beforehand. Please contact EMSOW Support if you wish to set it up. Here’s a quick tip on how to enable this functionality: click Preferences in Physician Portal and select Show study documents. By the way, this EMSOW improvement was suggested by one of our customers! This week Apple has announced that the new AirPods will look the same as the previous model. Meanwhile, our team has added a couple of updates to EMSOW. Many doctors prefer receiving their reports by fax. Fax delivery may fail for multiple reasons, e.g. the fax machine did not respond, the line is busy, a voice answer was detected. Previously, EMSOW informed about the failure, but did not inform about the failure reason, which hampered troubleshooting. With this update, you can hover your mouse pointer over the “failure” label in the Reports Delivery Tracking module to see a detailed message about what happened. Due to a bug, EMSOW used to add purchased service charges to the balance of procedures. We have fixed the bug, and now these charges are only added to claims as an informational field (Box 20 of the HCFA form) and do not affect the balance. You can still see the purchased service charges as transactions in the Billing information window. EMSOW appreciates your feedback. Found a bug? Contact EMSOW Support and help us improve! You are welcome to follow us on Facebook, Twitter, and LinkedIn! Previously, the system always printed the default billing company information in the upper-left corner of an account statement. With this update, we made it possible to print the information of the company that is assigned to the study. If you wish to enable this functionality, please contact EMSOW Support, and we will check your settings. One more update to the account statement form: it is now possible to include the rendering provider name.